UPDATE: Darn, I’m getting a bad gateway error now? 🙁 This one might take some patience and refreshing, otherwise I’d check back in a bit when its working better. 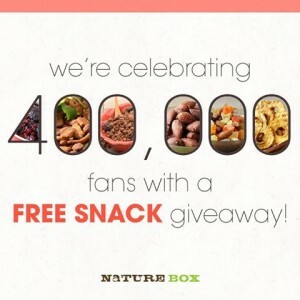 Click here to visit the Naturebox facebook and like them. Then on the “Free Snacks” tab, allow their app, and click enter now. Finally choose your snack and fill out the form. You can choose between Cherry Ganache Granola, Mango Almond Bites, or Salsa Spiced Nut Mix.